Fencing is a sport unlike any other. A sport that appeals to girls every bit as much as boys, that can appeal to kids who have never found a passion for any other sport, that can be taken at any age and played for life. 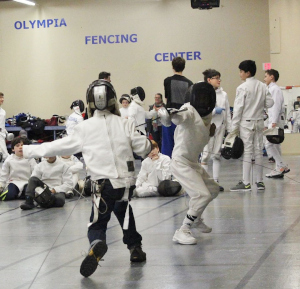 Located in the Alewife section of Cambridge, Olympia Fencing Center it’s the only fencing club in the country to offer an innovative introduction to the Olympic sport of fencing. Our programs are specially designed to teaching both beginner and advanced fencing, following the East European school of fencing. In our process to starting a fencing revolution, we’re also the first club in New England to introduce junior fencing classes and competitions for children 4 to 8 years old! Competitive fencing is one of the fastest-growing sports in North America, and, as witnessed by the sound of weapons clanging and people of all ages, lunging and parrying in our studio – Cambridge just might be the next home to an Olympic champion! The Olympia Fencing Center coaching staff consists of world-class fencing masters and professional educators. All our instructors make learning fencing fun and enjoyable and aim to give our students a competitive edge on the strip. Our club is open seven days a week, for group classes, private instruction, open fencing, along with fencing camps and birthday parties for kids. Co-ed camp, designed for children ages 6- 12, with little or no fencing experience. The campers will learn about the Olympic sport of fencing in a fun and safe environment. Our large facility includes 15 electrical fencing strips, changing rooms, view area for parents, homework station, kitchen space (fridge, coffee maker), AC. All fencing equipment is provided. Our experienced coaches will teach you to hold a sword and the tricks of the first touch! All our coaches are United States Fencing Association professional members, CORI verified, with extensive experience working with children. Every child brings home a camp T shirt and lots of great memories! Featuring an ample parking lot, 15 fencing strips, the only custom made for shock absorption fencing floor in the country, state of the art fencing equipment and world class coaching - we're here to make a difference, We Raise Champions! Located 10 minutes from the Harvard Square, a short walk from the Alewife Red Line T Station, right across Fresh Pond and off Concord Ave.
For the last year and a half my son has fenced at Olympia Fencing Center. I cannot speak highly enough of the coaching staff, facility, and overall spirit of the club. Coaches Daniel and Iliya are highly accomplished fencers themselves but more importantly extremely skilled at instructing, motivating, and mentoring their students. I have watched my son develop a love for a sport he previously knew nothing about. Olympia encourages all their members from novice to world class to become a part of their fencing family. My son and I highly recommend Olympia to anybody interested in learning more about the sport of fencing.